Is there a financial impact if my property offers a selection of telecommunications providers to residents? How much value do I gain from a signed lease if my property has the latest services that residents require? 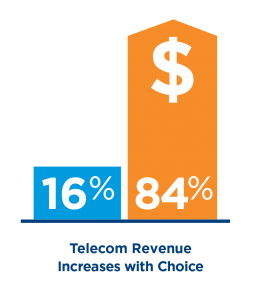 Do I lose a leasing opportunity if a competitive property offers different telecom services? How are my existing telecommunication contracts performing? Do my properties have the opportunity for a new or renewal contract? Was the last proposed vendor contract I reviewed fully executed by the vendor and implemented? These are some of the questions multifamily housing owners ask as they work to maximize the value of their assets. Providing the best telecommunication services to your residents and enhancing your vendor contract opportunities help you meet business goals. Today, residents have specific preferences for telecommunication providers and services. They competitively shop for these amenities when evaluating different multifamily communities. Services that residents may not need or understand, like Fiber-To-The-Unit and gigabit internet speeds, are services about which your leasing agents are being asked. This heightened competition against other properties with differing and newer technologies makes it necessary to provide telecommunication services that residents want for their digital lives. When these services impact your leasing, they impact your bottom line. Choice exclusively represents multifamily owners, manager and developers in vendor service negotiations to maximize revenue opportunities. With each client engagement, we begin with a no-obligation analysis of your entire portfolio. The Choice team gathers your existing contracts to determine which vendors provide service to each property and which specific services they provide. We also research the possibility of alternative vendors for your communities. Next, we identify contracts that have expired or are on automatic renewals to determine if there are new or early renewal opportunities. Our insightful analysis assesses your entire portfolio so we can provide you with competitive proposals and future opportunities as they arise. This consistent long-term approach not only saves you time, it gives you the information you need to make sound decisions. Our professional full-time staff does the work for you by finding opportunities, negotiating the best terms and assuring your residents have the best telecommunication services available. Choice presents you with the vendor proposals then the final decision about each proposals is always yours. The Choice team implements our systematic tracking to verify that vendor marketing-fee payments tied to your contracts are received. We assure that payments are not missed, are being paid correctly and on time so you can focus on your highest priorities. By auditing existing contracts, Choice successfully finds, recovers and collects back payments due from service providers. These missing payments often arise when properties are sold, payments are not started after contract execution, changes in vendors and staff turnover on your property. Choice uses this proven process of complete research and analysis to proactively position you to maximize your portfolio revenue. Contact Choice for a no-obligation consultation to see how your portfolio revenue can be maximized. Our name and logo are the registered trademarks of Choice Property Resources.